Little toastie sandwiches, filled with melting Irish Cheddar and piquant pickled pears, are (adorably) presented right in their own hollowed out bread loaf. This recipe makes 2 pints of sweet and tangy pickled pears perfumed with caraway and bay. You won’t need that much for the toasties, so you’ll have pickled pears in your fridge for a month, if they last that long! Enjoy them with cheeses and charcuterie, in salads and sandwiches, or as a tasty snack. To make the pickled pears: Halve and core the pears, and slice each one lengthwise into 1/8-inch-thick slices. Pack the slices into 2 wide-mouth, pint-size glass canning jars, or other heatproof container(s). Bring the vinegar, water, honey, salt, caraway seeds, and bay leaves to a boil over medium-high heat in a small saucepan, stirring until the honey and salt are dissolved. Boil for about 2 minutes. Pour the hot brine into the jars, completely covering the pears. Cover the jars with lids and set aside to allow the brine to cool to room temperature as it pickles the pears. 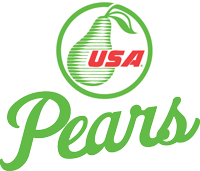 When completely cooled, use right away or refrigerate the pickled pears for up to 1 month. To make the toasties: First preheat the broiler. Using a bread knife, saw off the top crust of the bread, just where it begins to dome (if it is a flattop loaf, then just saw off about ½ inch of the top crust); set the top aside. 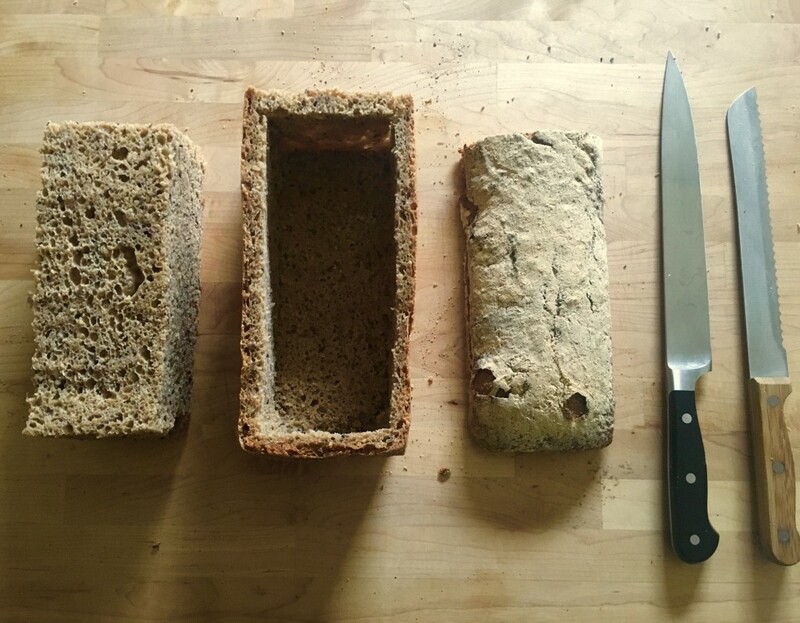 Now cut out the inside of the bread in one giant rectangle, so that you will basically have a crustless smaller loaf within the outer shell of crust. Here’s how to do that: Saw around the perimeter of the bread parallel to the long and short edges of the loaf, leaving about a ½-inch border on all edges and without cutting all the way through the bottom crust. Now cut a slit through one of the long edges of the crust that runs parallel to the bottom crust, about 1/2-inch from the bottom of the loaf, leaving about a ½-inch border on either end of the loaf so as not to completely slice off the bottom crust; this will free the inside bread rectangle, leaving a long slit toward the bottom of the bread bowl (but that won’t matter, it’s a secret!). Carefully remove the now crustless interior rectangle of bread and cut it into 16 slices. Arrange the slices in a single layer on a large, rimmed baking sheet and brush the top sides with butter. Place them under the broiler, about 4 inches from the top heating element, until nicely toasted. Flip and toast the slices on the other side. Remove them from the oven, and now preheat the oven to 400˚F. Top 8 of the toasted bread slices with a slice of cheese and then 2 slices of pickled pear. Place the other 8 bread slices on top, creating 8 little toastie sandwiches. Stuff the toasties back into the hollowed out bread “basket.” You will likely only be able to fit about 6 of them inside, so set the other 2 aside for now. Replace the top of the bread. Wrap the entire loaf in a sheet of aluminum foil and place it on the center oven rack. Bake until the cheese is melted, 30 to 40 minutes. Place the remaining 2 toasties on a small baking pan and heat them in the oven a few minutes before the big loaf is done, just until the cheese is melted. To serve, place the bread basket and extra toasties on a large platter, and enjoy while the cheese is hot and melty! 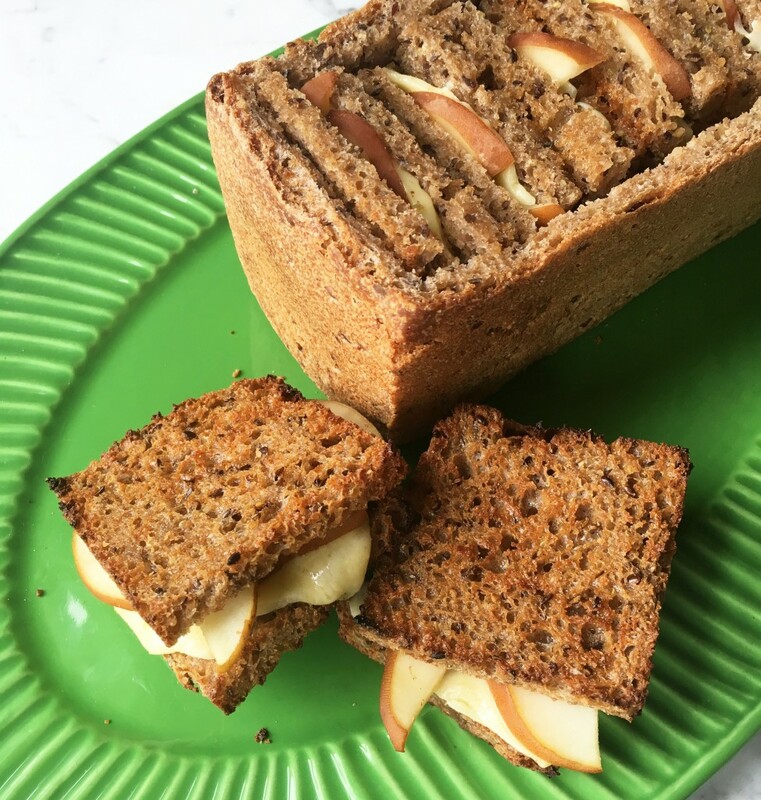 This entry was posted in Food and Drink Recipes and tagged apple, apples, bosc, breakfast, cheddar, cheese, culinary, fiber, fruit, pear recipes, pears, recipes, sandwiches, Spring, St. Patrick's Day by Andrea Slonecker. Bookmark the permalink.